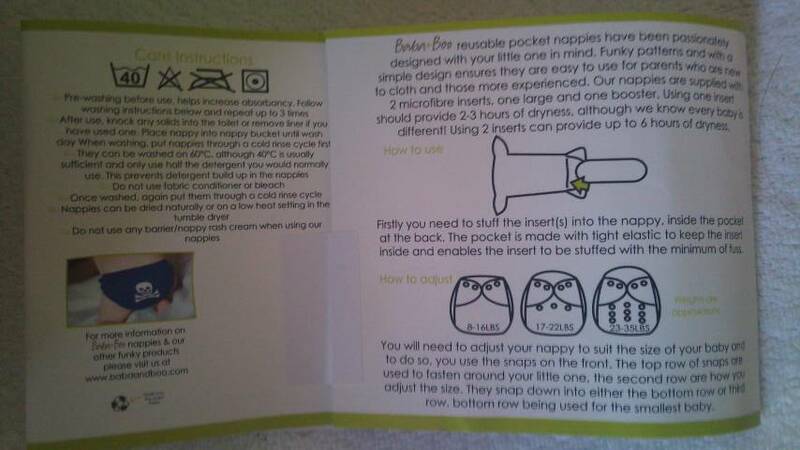 As you will know I was recently lucky enough to win a fantastic ‘Real Nappy’ kit from Recycle for Greater Manchester. I was ecstatic to have won and am thrilled with Elizabeth’s new collection of Fluff! However before winning the prize I had already started to use real nappies on my daughter and as a penny pinching mummy I looked around for the ‘best value’ options. That is when I discovered the fabulous Baba+Boo! Baba+Boo was born in October 2009 after founder Eve Bell struggled to find funky nappies for her daughter and thought the few mainstream brands that existed were expensive. 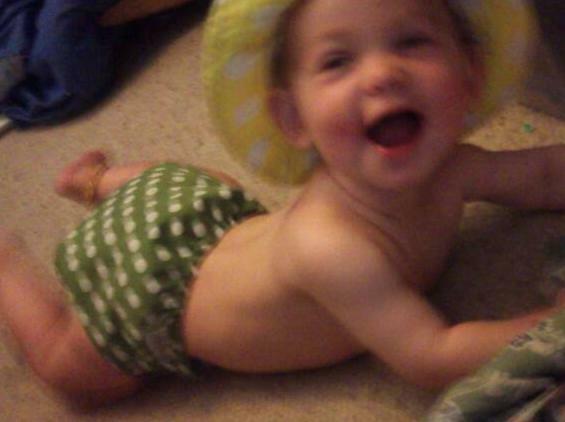 So she used her previous experience as a Buyer to source good quality nappies in funky designs at low prices. Since then the brand has grown to encompass not only nappies but clothes and accessories, mainly designed by Eve. Not bad for a business which was started in Eve’s spare room and run in the evenings once her children were in bed! Baba+Boo always aims to source products which have been produced under strict ethical codes of conduct so customers can be sure that the products their babies are wearing have been made with love! 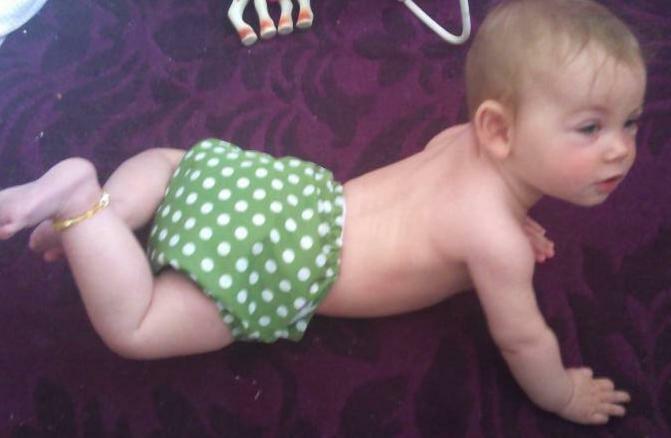 The lovely Eve kindly sent me one of her new ‘Limited Edition’ nappies in Green Spots to review. Babo+Boo nappies are pocket style nappies which are one of the easiest to use but also quickest to dry styles of real nappy that are great for childcare or ‘Daddies’ (as you just slide the insert in the pocket and fasten on baby much like a disposable and then shake it out into the nappy bucket ready to wash) Pocket Nappies are a favourite in our house as they are so simple. When the package arrived, I opened it and as soon as I saw the design I loved it! In terms of funky nappies I have found it can difficult to get nice unisex patterns (and having a baby girl after a while you do get a bit of an aversion to the colour pink!). I have always loved the colour green, and Elizabeth really suits it. The packaging is kept to a minimum with the care instructions printed on a recyclable cardboard sleeve. 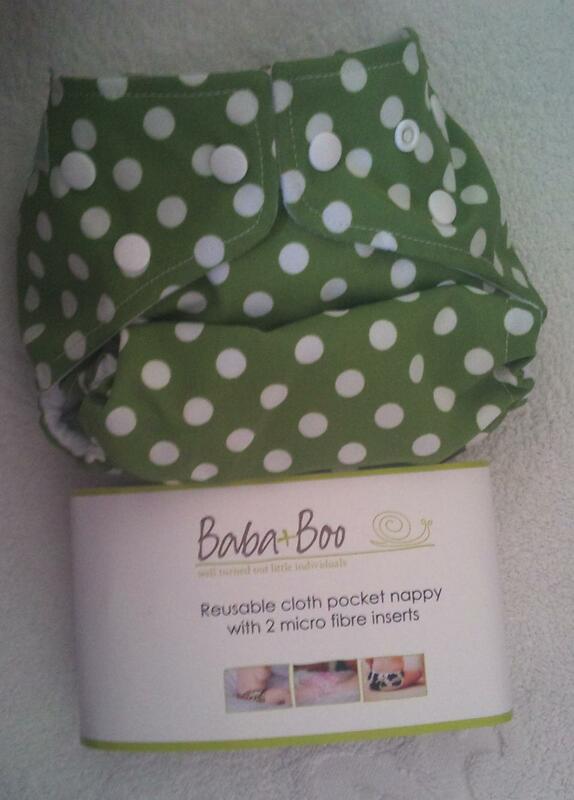 Baba+Boo nappies are ‘birth to potty,’ adjusting with a series of poppers on the front. The new limited edition range have a slightly higher rise than the previous style so are suitable from 10lb - 37lb, The outer fabric is a fantastic quality printed poly/cotton with a waterproof lining, and they come with two microfibre inserts both of which fold down with poppers to adjust. The nappy is also fastened by poppers, which I favour over Velcro as curious little hands cannot pull them open! I couldn’t wait to try the nappy on Elizabeth and I was in luck as after prewashing and hanging on a maiden overnight it was completely dry by morning! The feel of the nappy fabric when I was putting it on Elizabeth was lovely, very different to the thin ‘cheap’ feeling material I have been used to from other nappies in this price range! 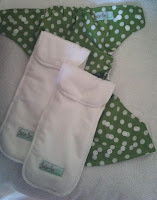 The fleecy inner of the nappy was beautifully soft and the microfibre inserts were lovely and thick. 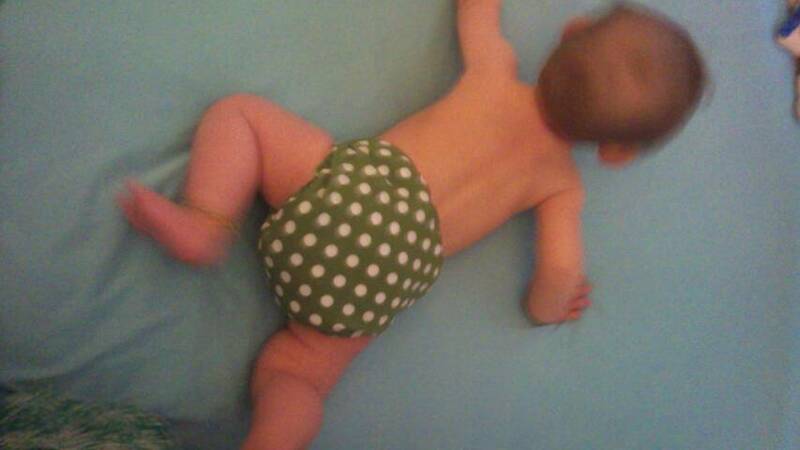 One thing I absolutely LOVE about this nappy is the poppers to fasten it! 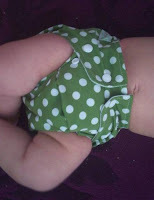 Although eight months old, Elizabeth is a fairly skinny baby and is still on the smaller setting on most ‘birth to potty’ nappies, and this nearly always results in the ‘wings’ of the nappy hanging down at the sides, which means a poor fit around the legs. 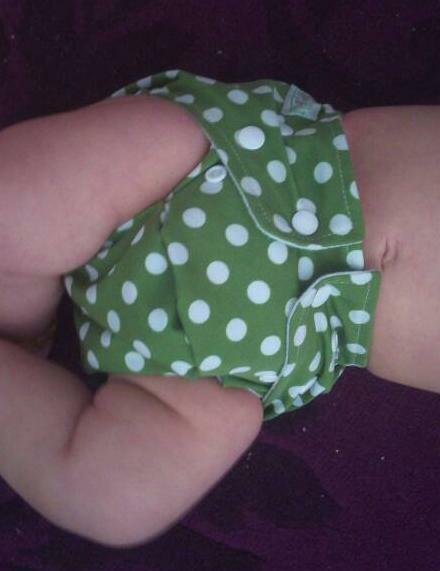 This Baba+Boo nappy has an extra popper at each side to prevent this from happening! (Thank you Eve!). When I changed Elizabeth she had had the nappy on for four hours (longer than I usually leave a nappy during the day but as I had predicted she had taken a longer nap). Her skin was totally dry and the nappy had absorbed and contained excellently. The next time Elizabeth wore the nappy I used just one insert and noticed that it still fitted fantastically but did look a lot slimmer on her botty. We were at ‘stay and play’ and she was rolling about, commando crawling, playing in the ball pool and generally being her very wriggly self. Even with all of this the nappy did not budge, and when changing her after 2 and a half hours (only because of a poop) the nappy had again done its job fantastically. 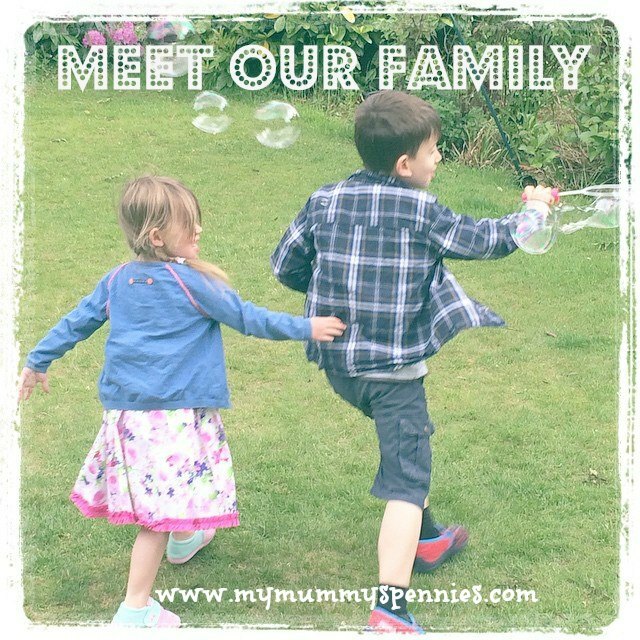 Although we tend not to use pocket nappies at night (we have part of our stash that are dedicated night-time nappies, bulky but very absorbent) In the interest of giving you a full picture we did use it overnight and I was impressed with the performance! Elizabeth co-sleeps with us so although she does still feed at night, she just wriggles on to me and I don’t disturb her further by changing her. Because of this she has a nappy on for up to 12 hours overnight and is quite a heavy night wetter. But the Baba+Boo absorbed well and did not leak at all. Elizabeth has worn the Baba+Boo nappy regularly over the last few weeks and it has grown to be one of the first I reach for after a wash! The material is nice and cool on her in the muggy weather we’ve been having and I’ve loved being able to show it off by pairing with just a t-shirt to play at home or in the garden! The Baba+Boo Limited Edition Nappy is really simple to use (Daddy was able to put it on correctly without me having to explain 17 times…) It dries incredibly quickly (Elizabeth has actually worn this twice in a day on an occasion because it was the first one to be dry!) The fit is excellent and I cannot stress enough how great the extra side poppers are for a skinny baby like Elizabeth! The quality of the material is stunning and is on par with nappies that retail at a much higher price. I love the design, bright and bold but also unisex, the colour really suits Elizabeth and it would look equally as good on a boy, a pleasant change from pink! The Baba+Boo Limited Edition Nappies retail at £9.75 each, which is incredible value for this level of quality and reliability. (Big Brand pocket nappies usually retail at around £15 upwards...) Baba+Boo also offer great bundle discounts with a set of 3 of these nappies for just £26 and a set of five for just £43! 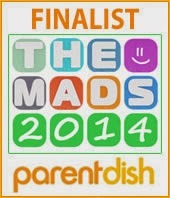 I would recommend them to any parents wanting funky and reliable cloth on a budget. As well as the Green Spots design that we were sent, there are four other funky prints in this range, you can check them all out on the Baba+Boo website here. As well as these fantastic Nappies, Baba+Boo also sell a lovely range of funky clothes and accessories at affordable prices, these can all be found on www.babaandboo.com. 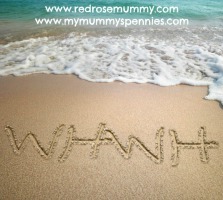 They also have a facebook page where you can keep up to date with news and offers. this collection of design are super and very nice post. new design are very good. all collections are pretty good..and all the best for your future designs..